Love this look, the girls in the office love it too. Imbue your bedroom with the perfect blend of French country and shabby chic with this sumptuous and lovely coverlet set. Serene colors and touchable texture coalesce in an elegant and attractive look that delivers a little loft to your sleep space. It is beauitful. Love the colors. It is just not wide enough. Need about 2 more inches in the width. This coverlet meets our needs and color likes perfectly. I have already washed it in my washer machine twice. I hung dried it the first time and it still seemed like it shrunk a little. The second time I dried it in the dryer and it seemed to have little to no change. It is nice and thin and the pattern is beautiful and tasteful. It seems very well made. Love, love, love it. Makes our new master look so fresh, clean and bright. Just as pictured! I purchased the full size. I washed it immediately upon receiving it hoping that it would shrink as some have posted, but mine didnt :( i like my bedding not to touch the floor and this bedding indeed touches the floor. It is very well made and has a thickness to it that will work well for winter months but may be too heavy for summer I will have to see. The colors are true to the photo and the pattern is soooo lovely it reminds me of an English tea party setting :) the decorative toss pillows are simply gorgeous indeed! The workmanship of this bedding will make it last for years! It is so very well stitched I have washed and dried it now 3 times in the short 2 months that i have had it (still hoping for it to shrink, but no luck on that happening). For now i tuck the sides and ends to keep it from touching the floor (i have just never liked bedding to touch the floor that OCD thing going on lol). It took me years to find bedding that i actually love and this one fits the bill! Love it! The pictures do not do it justice, its more beautiful in person. I love this set, I have 3 small dogs, so I needed a machine washable set. Its light and airy, it goes perfect with the lamps. curtains, sheets, and bedskirt I bought from Overstock. I love this set! It is exactly like it is shown, the colors are beautiful. I have a foot board on my bed, and this works wonderfully. The pillows are a great accent! 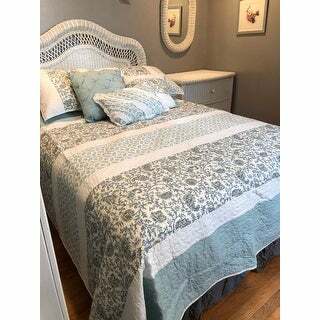 We bough this absolutely beautiful coverlet set to go with a bedspread set that we bought at the same time. It's a supplement to what's already on the bed, for those chillier days. 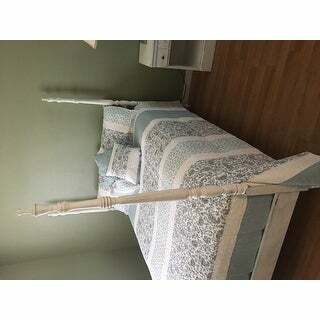 But the coverlet is also perfect on its own, especially in warmer days. It can be coupled with any of a number of other blankets, and look really,really good. I, personally, love layering blankets. I'm an interior decorator, and I like to mix and match, especially because doing so provides variety and change in homes that are, by their very permanent nature, normally somewhat stagnant. We got the king size and it's the perfect size for our bed with plenty of drape on all of the sides. 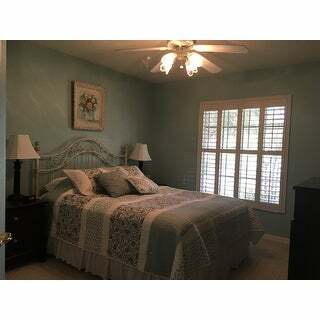 This bedding is a beautiful pale blue, almost aqua color, a blue gray. It's very well made and substantial. And it looks really good. I highly recommend this versatile, usable, attractive, well-made bedding product. This quilt is well made, colors are beautiful. Heavy feel and great snuggle quality! This quilt is beautiful. I was worried that the full/queen sice might me too small but it is perfect for my bed, which is even on 5 inch risers. Lots of compliments on it too. Love colors. Would like to see it 2 to 4 inches wider to better cover the mattress. Love this bedspread set! The colors are true to the pictures and the pillows are a lovely compliment to the quilt cover. I ordered a King set for our Queen bed because I didn't want to use a bedskirt. Looks great! Love the quilt. Just put it on the bed today. 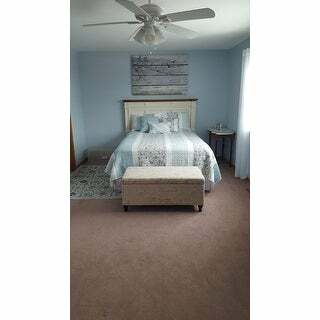 Love the way it looks and how fresh the room looks. The pattern lines do not go across the bed, instead they go the length of the bed. The color and pattern is pretty but I'm not sure I like the direction of the pattern. Plus there is a stain on one of the shams. I'll likely return as I'm not sure the stain will come out with washing. Love the color. I did not give it a give because some of the threading was coming apart, but I don't want to hassle with the return. And you can't really notice unless you know it is there. Love it. Good quality. Recommend for sure. Very nice! Perfect for spring and summer. Beautiful happy with this I ordered a second one! I bought this to compliment the matching comforter set. Now I have double the amount of accent pillows, which adds a WOW factor to the bed. The coverlet is planned as a summer weight cover. I bought the queen size to go over the king size comforter set, and I'm happier with the fit of the pillow shams from the coverlet set. The coverlet shams are quilted, which looks very rich on the bed. I love this set because it's completely washable and the quality of the sewing and trim is excellent. The fabrics are really pretty, too. There was a little bit of a shipping delay, but Overstock was fully prepared to replace the item if it didn't arrive. Fortunately it did, and I am very happy with the purchase. This set was such a good buy, and it was incredible quality. I enjoy all the soft yet distinct colors, They have brought my bedroom and bathroom together perfectly. It was the right colors. It could have been about 3" wider and 1 or 2" longer. It's hard to find a quilted coverlet that fits our king bed. They are all just a little to small. "A king size quilt never fits my bed. We have a split king tempur-pedic adjustable bed and it is extremely hard to get something to fit and have the proper drop on the sides. I wonder if this will work, anyone else have this situation?" "What color is the backing material on the coverlet?" The back of the coverlet is white. "Is the white on this quilt more of a bright white or an ivory?" "Is this a high quality quilt or is it a cheap version of a quilt "
It's in between. Not heavy duty. I prefer it lighter though. For summer I have the quilt and a sheet which is perfect. For winter I add a blanket. I love the colors and pattern. Hope this helps. I would say in between as well. It is so pretty when it is on . I love it and everyone that has seen it loves it too. For my queen I got a king just so I would have lots of length on the sides. I would say it is above average. I love the weight and it has washed very well. "Do you really need a bed skirt for a queen regular/plush mattress and box spring?" No, a bed skirt is not required. "Does a bed skirt come with this set?" No, but I found a bedskirt that fit perfectly on Overstock.com. I am so happy with the bed linen set. It sets just the right tone for a light, breezy tone for my bedroom. No. I am still looking for a bedskirt. I would love to find something other than white, but have not as of yet. "Could you please tell me the size of the King vs the Cal King. I want to ensure I order the correct size. Thank you"
If you have a CalKing bed you'll want to order just that, or it will not fit. You can find exact sizes of a CalKing vs. King mattresses on Google.